Ever on the phone with a friend and the call waiting beeps, you look at the caller ID and get excited because it’s someone you love? You quickly click over to start chatting and then they deliver some upsetting news…and you get the wind knocked out of you. That’s how we felt yesterday. We happily bounded up to the perinatologist’s office for my advanced maternal age ultrasound expecting to see our beautiful, healthy baby swimming along in my belly. Then we answered the caller ID. In a nutshell, the doctor saw some abnormal things going on. It was a blur of “bad implantation of the placenta”, “echogenic bowel” and “measuring more than 2 weeks small”. All in all, we learned that there are three likely explanations for what we witnessed yesterday: a chromosomal abnormality (like Down’s or Trisomy 18), a viral infection or a placenta problem. As I told my family yesterday, those are all crappy explanations if you ask me. Each has it’s own set of very scary risks, fears and complications. At one point, I wanted to look at the doctor and say, “Oh, I think you meant to deliver this news to the Wilson’s, they’re next door. We’re the Whitaker’s.” Then I answered the caller ID. So, we got all that laid on us in about 10 minutes, the doctor left the room and Scott and I just sat there in disbelief. Quite honestly, I think it was just shock. We left the office, asked the perinatologist to call my OB to explain his findings and we hopped up to Dr. Orth’s office to discuss our options with her. Man, I love her. It was a reminder that God gives you amazing counselors to turn to in difficult times. After some discussion of our options, we decided to have an amniocentesis. It’s tomorrow morning at 8:30. Folks, I was/am scared out of my wits. I’ve always been anti-testing. I figure it doesn’t matter in the end anyway, because we’re going to take and love this baby for however long God gives him/her to us. At the end of the day, that’s all that matters. But, when we learned that one of the possible scenarios, the viral infection, could be treated in utero and that the baby could start growing again, we opted for the test. Either way, we’ll get some answers. Granted, they may not be what we want to hear, but we’ll be able to deal with the outcome. So, to reality. We know the options. We’ve been scouring WebMD for some medical answers, I made a few phone calls to some sweet friends and my college roommate who’s an OB. Scott and I chatted last night and gained some more perspective. I was feeling ok, feeling some peace. Then, last night before I went to bed, I turned to the side, looked in the mirror at my little belly and just completely lost it. I guess I knew that was going to come, the reality of it all finally sunk in. I’m betting there will be more tears, but I’m also betting that God and I are going to spend some serious time together. At first I thought I’d post all this and say, ‘hey, offer up some prayers for good news on the amnio, we’ll keep you posted’ – that’s the selfish part of me. Yesterday taught me something else. I can’t pray that it will all go away. God doesn’t work that way. Instead, I’m asking you to pray for strength for Scott and I, wisdom for our doctor as he guides that needle into my belly tomorrow morning and for peace with the outcome. Sweet peace. Because this I know. We already have a little life to love. It might be in a different package, under different circumstances than our perfect world envisioned, but it’s life that was fearfully and wonderfully crafted by God himself just for Scott and I and the kids. How awesome is that? WB (Whitaker Baby) is such a lucky baby to have a family that is ready to love & accept them no matter who they turn out to be. To already be so loved and cherished is truly a gift for WB. Constantly amazed by your strength and faith, tears are allowed. All of our thoughts and prayers are with you and your family. Hey K – if I could reach right through the blog and give you a big hug, I would. I know that God has such a special plan for this life He has created – and He has specifically chosen you and Scott as this child’s parents… I will definitely be praying for you guys!! You have so much going on – with the move, etc. – know that I’m hugging you in my heart. Keep us updated… Your friend Kelley said it well – this baby is blessed to have you guys as his/her parents! We’re with you in prayer Sis. 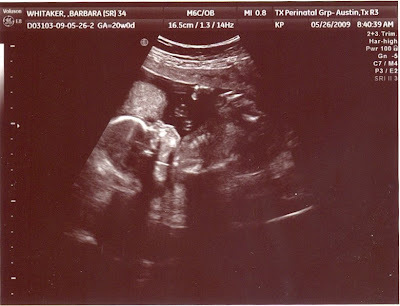 However, they may have the wrong person b/c the ultrasound says Barbara Whitaker. I’m with Nicole, I wish I could reach through and give you a hug. I will be thinking of you tomorrow and take time to say a special prayer for you, Scott and baby. We will certainly pray for your strength through tomorrow and days to follow. If anyone could do this, it’d be you! Ephesians 3:20 says “Now to him who is able to do immeasurabley more than all we ask or imagine, according to his power that is at work within us….” I will definately be praying for you this week that God would give you His peace that passes ALL understanding! May you and Scott cling to Him and the promises He give you in His Word. I had an amnio with my first (Calli) even though I said I wouldn’t. I felt confident to move allow them to do it because they do them all day long, I am SURE you are in good hands. Don’t be anxious, God is in control! sending love and hugs and prayers…you are amazing. Just reading this now as you are at the office. Know that the Sovereign Lord is FOR you, Scott and baby Whitaker and He will walk before you and with you. I pray abundant peace over you today…Big hugs and prayers from Houston. D, I knew I could rely on you to make me laugh. I’m really humbled by everyone’s sweet words and offers of prayer. They really, truly, mean more than you know. You’ll be in my prayers. I do hope and pray that you will have a positive outcome. I know what it’s like on the other end of the spectrum – my daughter died when she was 2 days old – and you just keep going because there is no other option. No matter what, lean on Mary. She’s been through it all with her baby – watched him, grow, suffer and die. She will hold you.